Rajinikanth Film Review From Shivaji. Shivaji Movie. Rajini Film Shivaji. Rajinikanth Shivaji movie. www.rajinikanth.com. 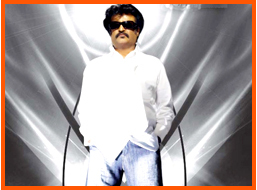 Sivaji The Boss is a forthcoming Tamil film, set to be directed by S. Shankar. It stars Rajnikanth, Shriya Saran, Prakash Raj, Vivek and Suman and includes Mallika Sherawat, Nayantara, director Shankar himself and Raghuvaran in guest roles. The movie will be subsequently dubbed into Telugu. The film's score and soundtrack will be written by acclaimed composer A.R. Rahman. The first schedule of the movie was shot at Hyderabad's Ramoji Rao Film City. Sivaji has given rise to great expectations due to the high-profile artists involved in its creation. The film was set for a 2007 Tamil New Year release but may be delayed until May 8, 2007. The storyline of AVM's Rajini starrer "Shivaji" is at least out after months of speculation. The puja for the new project was performed last month. It is gathered that Rajini is to play multiple roles - at least seven in the film. The theme is about higher education and how it has been commercialised by interested parties, making it unaffordable for many. Director Shanker had already touched on this subject in 'Gentleman' which was a run-away success, and this time in "Shivaji", the subject will be gone into deeply with high=profile Rajini playing the central role with his wellknown aplomb and characteristic style. What inspired Shankar is said to be a recent real-life incident in which a former MP was done to death in a southern district of Tamil Nadu at the instance of an engineering college owner out of rivalry. In "Shivaji", Rajini returns from abroad with the objective of establishing a college where he intends providing higher education charging the same fees as in government-run colleges do without capitation fees. He gets the backing of the State machinery in his venture. But the vested interests and the lobby controlling higher education are up in arms against Rajini and waiting to strike at him. In the meantime, the elections come and the ministry is voted out. With the new ministry being formed, anti-Rajini lobby becomes very active and makes things difficult for Rajini. With the result, the college project gets delayed and Rajini faces several hardships. He abandons the idea of taking legal steps and adopts his own methods to fight the lobby and he ultimately succeeds. It is learned that Director Shanker himself outlined the story to his 20-odd assistants whom he has selected through an advertisement. The response to the ad was overwhelming and as many as 2000 applications were received. Shankar selected 20 of them after he heard from them how they would end the story. A leading Mumbai-based portfolio photographer has shot the promos and publicity stills with Rajini and Shriya at a special set erected at a Mumbai studio. The teasers and promos are expected to be released in due course. Meanwhile, it is reported that Rajini has directed his "Thalapathi" Satyanarayana not to participate in any functions of his fans till the State Assembly elections scheduled for May next year, are over in order to avoid unnecessary political controversies. This Rajini's directive has come as a dampener to his multitude of fans who are planning to celebrate the actor's birthday on Dec.12 with great fanfare all over the State. The fans wanted to utilise the occasion also to give a boost to the making of "Shivaji" . Rajini has bald his head for an important climax scene in Sivaji the bosss. I don’t remember if Rajini as acted like this before. But if scenes or stills like this appear in this movie, definitely no one will be able to control the enjoyment of the crowd in the theaters! While Rajini’s movies are always meant to be flamboyant costing close to 40 crores, Kamal’s movies are nothing far behind. Kamal’s Dasavatharam is expected to touch a 35 crore budget mark owing to its added attractions like Himesh Reshmmiya, Mallika Sherawat, and Kamal himself in 10 different roles. Out of Sivaji’s budget, Rajini takes home close to 20 crore which is more than just half of the budget. Next comes Shankar with a paycheck of 3 crores. Rahman’s paycheck is two crores and the heroine Shreya is paid 30 lakhs. Other expenses like special effects, technicians’ wages, outdoor shooting expenses – especially in locations outside India contribute to the rest of the budget. Luckily, and to the benefit of the producer, Rajini’s movies have a minimum guarantee all over the world. His flicks will be sold at a minimum of 30 lakhs per print, which almost covers up the entire budget that was spent on the moviemaking. If that is not enough, the movies promisingly make a huge profit almost all the time. In rare instances as in case of Baba, if the movie fails to make profits, Rajini calls on the distributors and disburses the loss incurred thereby equating the earning and the expenditure.